Nothing goes to waste at Mustard Seed Communities. When in kind items are received, great efforts are made to ensure that each and every item is put to use where it is needed most. Gifts in Kind reach the communities of Mustard Seed in two ways: Containers are filled with necessary goods and shipped to our various locations. Mission volunteers also often bring in kind goods when they travel to Mustard Seed. Shipping costs are prohibitively expensive, so it is invaluable when mission volunteers pack donated items in their luggage. Please keep in mind that our needs are constantly changing. Please read the following wish lists closely when collecting Gifts in Kind. Groups can fill 20 and 40 foot containers with in kind items that they are able to collect from the community. Gathering enough in kind items to fill a container and the process of loading a container is a significant amount work; you will need a large team and the ability to collect enough materials to fill the entire container. If you are interested in sending a container, please contact us. Read more about shipping a container. One of the greatest needs at Mustard Seed is diapers. The majority of our residents use diapers, so they are an essential need at all of our communities in every size. Diapers are very costly and are an item we are grateful to receive in kind. Mustard Seed currently has a partnership with ISOH/Impact. 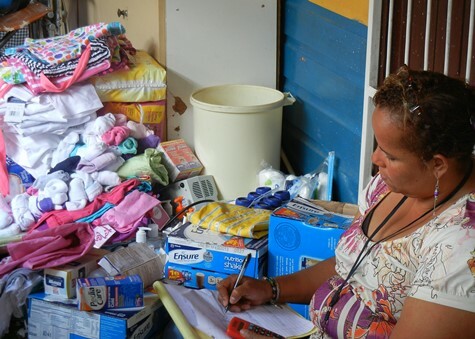 Through ISOH/Impact we are able to ship and receive a container of 60,000 diapers for a donation of $1,850. This partnership makes diapers less than 3.1 cents per piece, a price that makes this the most effective way to send diapers to our communities. This is a great Lenten, ministry, or school project! Mustard Seed is always in need of groups to sponsor or raise funds to ship containers of diapers. Please contact our office via email or at 508-242-9622 if you are interested in sponsoring or supporting a diaper container. Mustard Seed Communities and the children we serve thank you for taking the time to collect up in-kind donations. Every item received is one less item that we need to purchase, freeing up funds for medicines, food, to pay caregivers and the many other needs that cannot be donated in-kind. If you have in kind items that you would like to donate or if you have questions about shipping a container or about what items are needed, please contact info-usa@mustardseed.com.